The aim of this study was to investigate the relationship between food addiction and impulsivity in individuals young adults. 300 university students who continuing to their education on 2018 were included in this cross-sectional and descriptive study. Each participants fulfilled Yale Food Addiction Scale (YFAS), 30-item Barrat Impulsivity Scale (BIS-11) and a sociodemographic form. The SPSS 22.0 package program was used to statistical analyses of the datas. The prevalance of food addiction was found %21,7 (n=65) in participants. BIS-11 motor impulsivity subscale and BIS-11 total scores were higher in participants with food addiction than those without food addiction (p=0,007 and p=0,029, respectively). According to the result of regression analysis, BIS-11 total score was found as a predictor for food addiction (or=1,04, p=0,030). Impulsivity may be considered as a risk factor for individuals with food addiction. Bu çalışmanın amacı, genç erişkinlerde, yeme bağımlılığı ile dürtüsellik arasındaki ilişkiyi araştırmaktır. Kesitsel ve tanımlayıcı nitelikteki bu çalışmanın örneklemini, İstanbul ilindeki vakıf üniversitelerinde 2018 yılı itibariyle eğitime devam eden 300 üniversite öğrencisi oluşturdu. Her bir katılımcı, sosyodemografik veri formu ile beraber, Yale Yeme Bağımlılığı Ölçeği (YYBÖ) ile 30 maddelik Barrat Dürtüsellik Ölçeği’ni (BIS-11) doldurdu. Verilerin istatistiksel analizinde SPSS 22.0 paket programı kullanıldı. Katılımcıların %21,7’sinde (n=65) yeme bağımlılığı saptandı. Yeme bağımlısı olan bireylerin BIS-11 motor dürtüsellik alt ölçek skoru ile BIS-11 toplam skorları, yeme bağımlısı olmayan bireylere göre yüksek saptandı (sırasıyla, p=0,007 ve p=0,029). Regresyon analizi sonucuna göre, BIS-11 toplam skoru yeme bağımlılığı için bir yordayıcı olarak saptandı (or=1,04, p=0,030).Yeme bağımlısı bireylerde dürtüsellik bir risk faktörü olarak değerlendirilebilir. Pelchat ML. Food addiction in humans. The Journal of nutrition, 2009 139(3), 620-6222. Avena NM, Gold MS. Food and addiction–sugars, fats and hedonic overeating. Addiction, 2011 106(7), 1214-12153. Tuomisto T, Hetherington MM, Morris MF, Tuomisto MT, Turjanmaa V, Lappalainen R. Psychological and physiological characteristics of sweet food “addiction”. International Journal of Eating Disorders, 1999 25(2), 169-175.4. Gearhardt AN, Corbin WR, Brownell KD. Food addiction: an examination of the diagnostic criteria for dependence. Journal of addiction medicine, 2009 3(1), 1-7.5. Blumenthal DM, Gold MS. Neurobiology of food addiction. Current Opinion in Clinical Nutrition & Metabolic Care, 2010 13(4), 359-3656. Gearhardt AN, Yokum S, Orr PT, Stice E, Corbin WR, Brownell KD. Neural correlates of food addiction. Archive of General Psychiatry 2011 68(8):808-8167. Volkow ND, Wang GJ, Fowler JS, Logan J, Jayne M, Francheschi D, Wong C, Gatley SJ, Gıfford AN, Dıng YS, Pappas N.“Nonhedonic” food motivation in humans involves dopamine in the dorsal striatum and methylphenidate amplifies this effect. Synapse, 2002 44(3):175-180.8. Krmpotich T, Mikulich-Gilbertson S, Sakai J, Thompson L, Banich MT, Tanabe J. Impaired decision-making, higher impulsivity, and drug severity in substance dependence and pathological gambling. Journal of Addictive Medicine 2015 9(4):2739. Crews FT, Boettiger CA. Impulsivity, frontal lobes and risk for addiction. Pharmacology Biochemistry and Behavior, 2009 93(3), 237-247.10. Gearhardt AN, Corbin WR, Brownell KD. Preliminary validation of the Yale Food Addiction Scale. Appetite 2009 52:430-436.11. 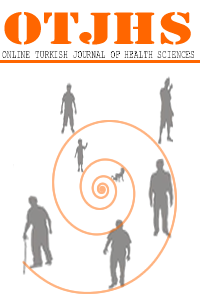 Bayraktar F, Erkman F, Kurtuluş E. Adaptation study of Yale food addiction Scale. Bulletin of Clinical Psychopharmacology, 2012;22 (1): S38.12. Patton JH, Stanford MS, Barratt ES. Factor structure of the Barratt impulsiveness scale. Journal of Clinical Psychology 1995;51:768–74.13. Güleç H, Tamam L, Yazıcı Güleç M, Turhan M, Karakuş G, Stanford MS. Psychometric properties of the Turkish version of the barratt impulsiveness scale-11. Klinik Psikofarmakoloji Bülteni 2008;18:251–8.14. Kıcalı F. ‘Üniversite Öğrencilerinde Beslenme Alışkanlıkları Ve Yeme Bağımlılığının Farklı Kişilik Özellikleri Ve Psikiyatrik Belirtilerle İlişkinin İncelenesi’. Tıpta Uzmanlık Tezi, T.C. Selçuk Üniversitesi Tıp Fakültesi, Konya 2015.15. Balaman İ. ‘Bakırköy İlçesindeki Yetişkin Popülasyonda Yeme Bağımlılığı Ve İlişkili Etmenler’. Yüksek Lisans Tezi, Haliç Üniversitesi Sosyal Bilimler Enstitüsü Psikoloji Anabilim Dalı Klinik Psikoloji Yüksek Lisans Programı, İstanbul 2017.16. Brunault P, Ballon N, Gaillard P, Reveillere C, Courtois R. Validation of the French version of the Yale Food Addiction Scale: An examination of its factor structure, reliability, and construct validity in a nonclinical sample. Canadian Journal Psychiatry 2014, 59, 276–284.17. Davis C, Levitan RD, Kaplan AS, Kennedy JL, Carter JC. Food cravings, appetite, and snack-food consumption in response to a psychomotor stimulant drug: The moderating effect of “food-addiction”. Frontiers Psychology. 2014 5, 40318. Gearhardt AN, Boswell RG, White MA. The association of “food addiction” with disordered eating and body mass index. Eating Behaviors 2014 15, 427–433.19. Meule A, Kubler A. Food cravings in food addiction: The distinct role of positive reinforcement. Eating Behaviors 2012 13, 252–255.20. Gearhardt AN, Boswell RG, White MA. The association of “food addiction” with disordered eating and body mass index. Eating behaviors, 2014 15(3), 427-433.21. Eichen DM, Lent MR, Goldbacher E, Foster GD. Exploration of “food addiction” in overweight and obese treatment-seeking adults. Appetite 2013, 67, 22–24.22. Flint AJ, Gearhardt A, Corbin W, Brownell K, Field A, Rimm E. Food addiction scale measurement in two cohorts of middleaged and older women. The American Journal of Clinical Nutrition 2014, 99, 578–586.23. Velázquez-Sánchez C, Ferragud A, Moore CF, Everitt BJ, Sabino V, Cottone P. High trait impulsivity predicts food addiction-like behavior in the rat. Neuropsychopharmacology, 2014 39(10), 2463.24. Hernandez J, Cervoni C, Hymowitz G. The effects of impulsivity on food addiction and eating behaviors in a bariatric sample. Surgery for Obesity and Related Diseases, 2017 13(10), S93.25. Meule A, de Zwaan M, Müller A. Attentional and motor impulsivity interactively predict ‘food addiction’in obese individuals. Comprehensive psychiatry, 2017 72, 83-87.